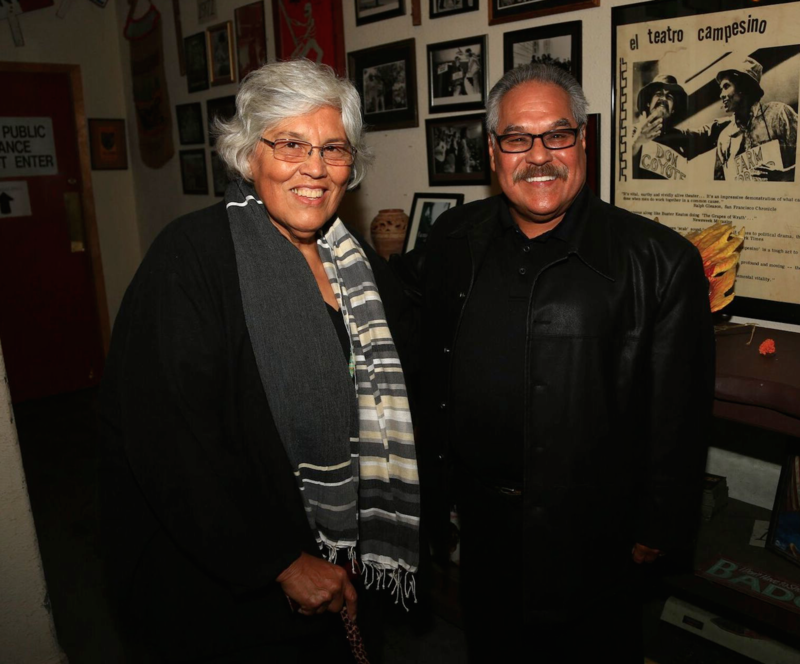 Luis Valdez (born 1940) is a playwright, film and theater director and activist widely regarded as the “Godfather of Chicano Theater” for his work as the founder and head of El Teatro Campesino. Born in Delano, California, he grew up in a family of migrant workers, traveling and working alongside his parents for several periods of his childhood, before eventually settling in San Jose and attending San Jose College (now San Jose State University). There he wrote and produced his first full-length play. After graduating in 1964, he joined the San Francisco Mime Troupe, learning the traditions of political theater of agitprop and commedia dell’arte. He would draw on these traditions to support Cesar Chavez’s United Farm Workers union, founding El Teatro Campesino in 1965 to perform improvised actos to organize and energize farm workers. El Teatro Campesino would continue as a company outside of UFW, producing works that became the basis of Chicano theater and cinema, such as the short film Yo soy Joaquin (I Am Joaquin, 1969), directed by Valdez, and his 1981 feature film adaptation of his successful play, Zoot Suit (1978). La Bamba (1987), a film about Mexican-American rock-and-roll legend Ritchie Valens, introduced Valdez to more mainstream audiences. He was a founding member of California State University Monterey Bay’s cinematic technology department in 1985. 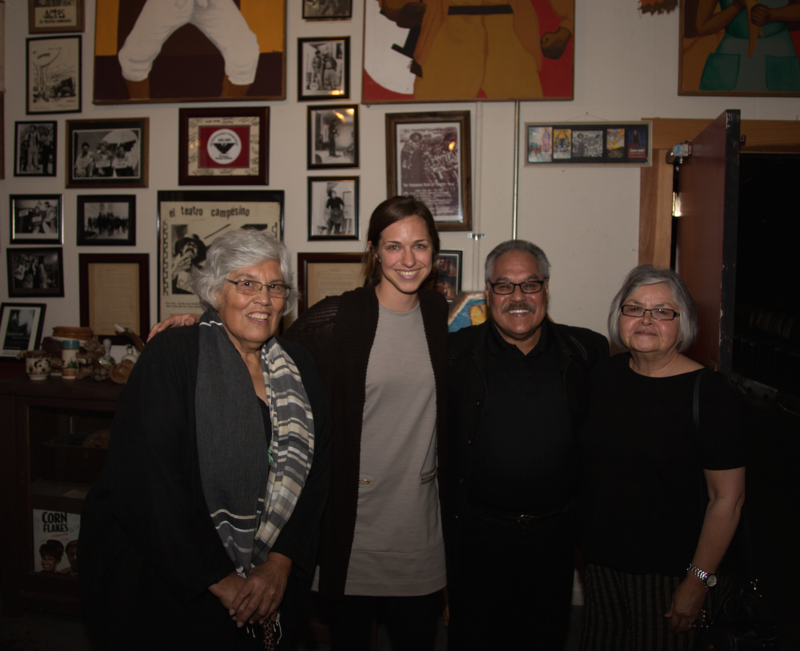 Playwright, film and theater director and activist Luis Valdez is interviewed by Lourdes Portillo at El Teatro Campesino in San Juan Bautista, California, on June 7, 2014. Valdez describes his early observations of California in the 1940s and 1950s as a child of migrant farm workers. He recalls how World War II impacted his childhood and shares his discovery of theater and literature as a small boy. He describes his memories of Delano, California, and how Mexican heritage and history was central to the community and has remained so in his career. He describes his early love for Western films, puppetry and acting. He details his involvement in theater acting and the San Francisco Mime Troupe and explains the atmosphere created by the Cuban Missile Crisis and the Vietnam War. Increasingly political, Valdez met Cesar Chavez and in 1965 began organizing a political theater troupe, El Teatro Campesino, in tandem with the development of a farm workers union. Valdez describes how they drew creative inspiration from Mexican and American culture, and how he developed the acto from the specific political circumstances of the Chicano movement. After he parted from Chavez, Valdez did theater tours and experimented with film, making the short Yo soy Joaquin (I Am Joaquin, 1969), one of the first Chicano films. Valdez talks about how he developed his skills as a director, finding a role model in African-American director Michael Schultz, with whom he worked on Which Way Is Up? (1977), and how he came to film Zoot Suit after its success as a play. He discusses his wife, Lupe Trujillo Valdez, and the crucial role she played as a collaborator and fellow theater actor. Valdez further emphasizes the importance of family, citing his longtime collaboration with his brother Daniel, who has also had a successful career in the arts. 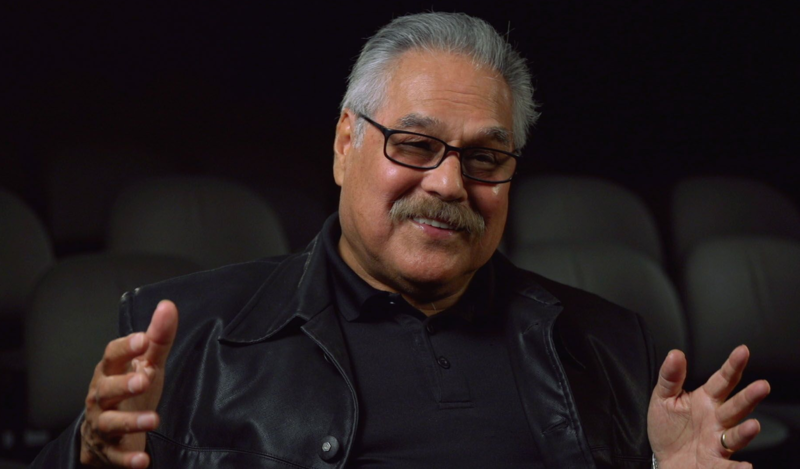 Valdez discusses his 1978 play Zoot Suit and his inspiration for the character of El Pachuco, who was played in both the Broadway and film versions by Edward James Olmos. He tells the story of making La Bamba (1987) and goes on to discuss his difficulties producing a project about Frida Kahlo due to Hollywood’s reticence to make a film about the female Latin-American artist. This difficulty has led Valdez to refocus on theater, though he expresses admiration for a wide variety of current-day filmmakers and artists from around the world.